Personal development and sustainable development hand in hand. 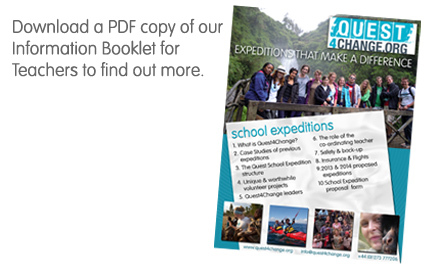 By arranging a school expedition through Quest4Change your students will help us change lives in Africa & South America. We are specialists in specific parts of the world. Our 15 years of knowledge and experience working in Africa and South America means teams can explore and learn more about the country they are visiting; taking part in activities most suited to the experience they are looking for. Our volunteer projects form the heart of our organisation and we are dedicated to the projects we work with. Years of building strong relationships and a long-term commitment to our project partners ensures real progress is made and that both project and the volunteer teams will benefit. Expeditions can combine voluntary project work with adventure travel, or simply one or the other, to create an expedition uniquely tailored for your school. We have an impeccable safety record, spend years developing and training our overseas leaders and only work in areas of the world we know best. We have also been externally assessed as compliant with British Safety Standard BSI 8848. We believe that the preparation for an expedition is as important as the expedition itself and will work closely with your school to ensure all participants are fully prepared and equipped. We are a small and personal organisation and as such can work closely with your school to provide the right level of support for you before, during and after your expedition.